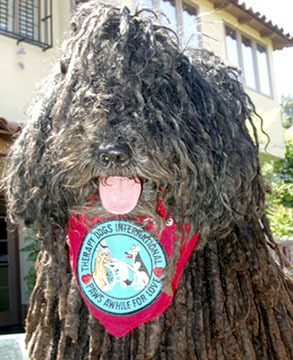 BALINT, a Hungarian puli, was a show dog, a movie star and a top therapy dog. Do our four-footed companions boost our health in many ways? “Oh gosh yes, absolutely. They’re good companions, they’re good watchdogs, and they help you meet people. “We’re always meeting people walking our dogs,” said Melinda Peters, a clinical social worker. One of them, Balint, before he passed, won top titles in agility, obedience and rally and worked in TV commercials and movies. But maybe most importantly he logged 500 hours of pet-assisted therapy at hospitals, nursing homes and Ronald MacDonald Houses. The Peters have had several therapy dogs over the years registered with Therapy Dog International (TDI). Temperament evaluations are offered at locations nationwide to determine “if dogs are ready and well trained enough to be therapy dogs,” says Karen Saunders, an evaluator for the program at Griffith Park. Saunders has talked to various organizations on the program, including Kiwanis, church and civic groups. She usually brings her own therapy dog to the talk, and, “I prefer to bring a few others if the venue is conducive to having several dogs,” she adds. Regular visits from all types breeds and mixes, rescues, large and small can stimulate conversation in mental health counseling. And simply petting a dog’s shiny coat has been known to encourage exercise and physical therapy. A waggy tail can bring sparkle to an otherwise dull day and rekindle memories of dogs loved in the past. By all accounts a dog prancing into a care facility brings smiles to everyone he passes. Clinical tests show petting, touching and talking with animals reduces blood pressure and eases depression, a TDI brochure states. “It was gratifying when patients in hospitals and nursing homes would ask for repeat visits and brightened observably when we came!” added Melinda Peters. For information on the volunteer, non-profit program visit tdi-dog.org.